REST has consistently delivered long-term investment performance for its members since it was established in 1988. As at December 2016, its largest investment option, the Core Strategy, had returned a positive 8.69% since July 1988. This means that a member who invested a dollar from the beginning would have grown that dollar by about 10 times. In pursuit of growing customers’ retirement savings above the rate of inflation over the long term, REST seeks to capture market opportunities by buying ‘cheap’ assets and manages downside risk by lowering its exposure to ‘expensive’ assets. REST will usually adopt investment positions with a defensive bias and may take positions different from the market based on research rather than seeking to produce results similar to other funds. 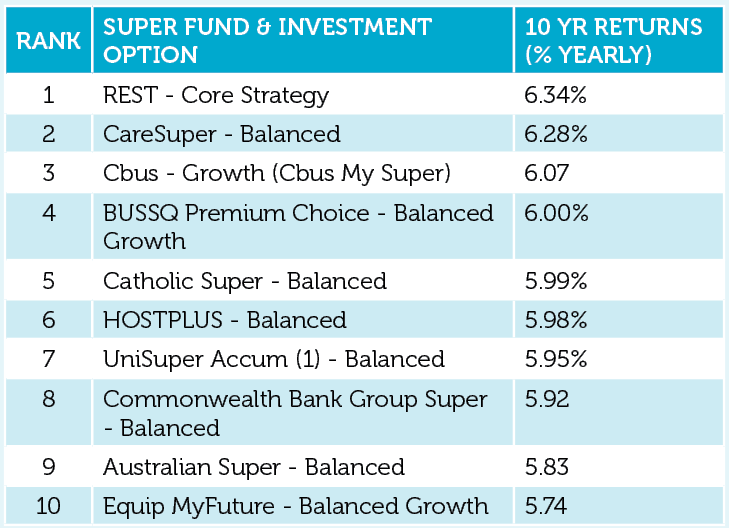 Incidentally, REST’s efforts have placed Core Strategy at the top of peer ratings for its ten year performance as shown in the table. 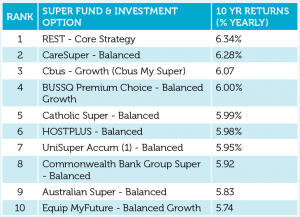 This means our members are invested in one of the best performing superannuation funds in Australia. Source: SuperRatings Fund Crediting rate Survey December 2016. Notes: Returns displayed (from 1 month through to 10 years p.a. ), are calculated net of investment fees, tax and implicit asset-based administration fees. Explicit fees such as fixed dollar administration fees, exit fees, contribution fees and switching fees are excluded.